The main objective when performing minimally invasive spine surgery is performed to relieve pressure that is causing the spinal nerves or spinal cord to fire with extreme pain and/or to stabilize the vertebral and spinal joints. The majority of the time, this pain is present as a result of conditions such as spinal instability, bone growth spurs, herniated or bulging discs, spinal tumors, spinal infections or scoliosis. As opposed to open spine surgery, minimally invasive spine surgery is performed on a much smaller scale, consisting of a 2-5 inch incision on the back. These surgeries are much safer, faster and can be healed in much less time than open spine surgery. 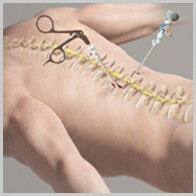 Minimally invasive spine surgery has many benefits compared to open spine surgery. The slight probability that the initial minimally invasive spine surgery cannot be finished once started, requiring either a second surgery or full open surgery. In minimally invasive spine surgery, the surgeon makes the small 2-5 inch incisions to allow visualization of the operating field by retracting the tissues beneath the skin and exposing the spine. Once exposed, the surgeon performs the necessary reconstruction unique to each procedure. To compensate for this limited field-of-view, surgeons like Dr. Moazzaz who utilize robotic technology use fluoroscopy (X-ray) images to view their progress. He uses the Mazor X robotic device, where his patients benefit from high levels of accuracy and the advantages of minimally-invasive surgery. Independent scientific research has shown that minimally-invasive surgery with robotics lowers complication rates, reduces postoperative pain, and aids in faster recovery with a quicker return to daily activities when compared to regular freehand surgeries.